This is a nice 2 bedroom house on the creek with a large private lighted fishing pier at the Caney Creek "Y". Fun and relaxation with excellent fishing! Downstairs bathroom for easy access to all-night fishermen. 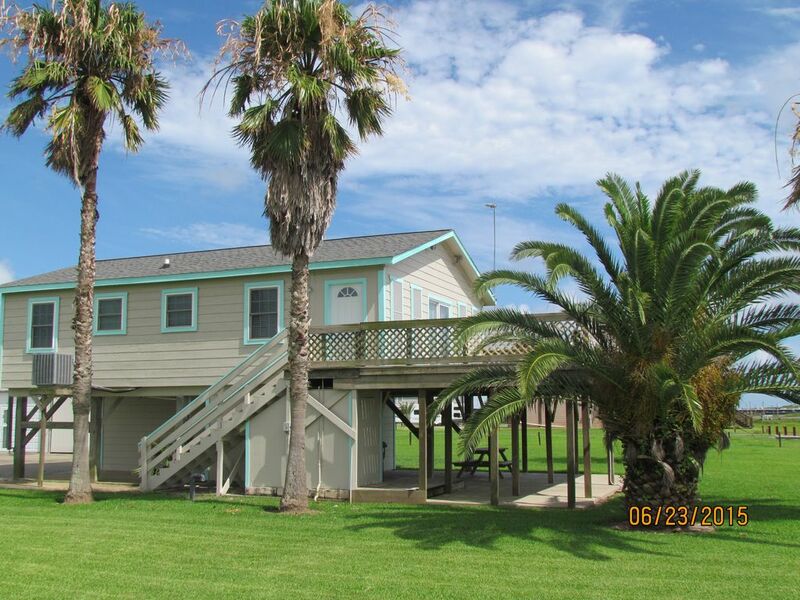 Less than one minute to the Intracoastal and 5 minutes to East Matagorda Bay by boat. Enjoy seeing unobstructed sunset views over the bay and marine traffic on the Intracoastal from the front deck. I'm the property Manager, having lived in Sargent 25 years and loving every minute! This House is owned by the Graham family who love to fish & hunt & who truly appreciate how special Sargent is. They are sharing their piece of saltwater paradise hoping to inspire you too with it's alluring & refreshing peace! You can hear the surf & feel its breeze as you visit with loved ones on the deck , watch the sunset or catch Redfish, Speckled Trout and Flounder on your pier. Super close by boat to East Matagorda Bay and Gulf fishing. Boat 5 minutes or drive 10 min to the beach. Huge concrete drive for all your trailers & extra parking. Creek Fishing all day or night on your own private pier. Gulf of Mexico just a short distance by car or boat provides surf & offshore fishing opportunities, beachcombing, & awesome sunrise views. Sargent is where you have amazing sunsets over the Bay and the prairie, sunrises on the beach. Spectacular birding with hundreds of species of birds, being sandwiched between two wildlife refuges. Enjoy your own private pier with night fishing lights, live well & crab traps, electricity & fresh water wash.
All kitchen and bath towels provided. Please bring your own beach and fishing towels. Full Kitchen- has all dishes, pots, pans & utensils needed. Private Pier- Fishing lights, crab traps, cleaning table, live box, & boat slip. Our family loved the weekend we spent at this vacation rental. There was plenty of space inside for 3 young kids to navigate. The ability to utilize the charcoal grill and picnic table came in handy. Having a lit pier and ground level bathroom kept the fishing going late into the night without disturbing those in our party that went to bed earlier. Everyone thoroughly enjoyed themselves. We're already trying to figure out when we can return! Was a perfect stay! Enjoyed the relaxing get away. Great pier and night fishing. Clean house and was very comfortable. Thank you for staying. So glad you enjoyed it!!! Loved it Great home and location. Clean, comfortable and accessible to easy fishing!! We will be back!! Our fishing guide quite possibly could have ruined our trip, but the homely and comfortable fishing lodge that we stayed in saved the trip. We had a blast catching cat's, red's and trout off the private pier! Saved this bachelor party for sure!! Sargent is known for its excellent fishing year-round. This is a friendly, laid back, and very patriotic community. We love our soldiers! Sargent offers several public boat ramps, covered picnic areas, and public restrooms along the beach. Don't have a boat? Consider taking a guided fishing trip with Captain Gene Allen of Living Waters Guide Service at (979)429-7150. Enjoying casual dining at one of the local restaurants, or tour some of the small gift shops throughout the town. Other attractions include The San Bernard Nat'l Wildlife Refuge, and The Sea Center 35 min away.